Recombinant monoclonal antibody to CD45RA or A/B. Manufactured using AbAb’s Recombinant Platform with variable regions (i.e. specificity) from the hybridoma OX-30. Immunogen: This antibody was prepared by immunizing BALB/c mice with rat lymph node glycoproteins. Specificity: This antibody recognizes all molecular forms of rat L-CA, and is noncompetitive with OX-1, 28 and 29 in binding to L-CA. While purified L-CA inhibited binding of this antibody to lymph node cells, no such inhibition of binding was seen with reduced and alkylated L-CA. Application Notes: This antibody binds all molecular forms of rat L-CA, and consequently can be used to label thymocytes, T cells, B cells and most bone marrow cells (Woollett, 1985). Note on publication: Describes the original use of this antibody in FC and blocking analysis to assess the molecular and antigenic heterogenity of rat L-CA. Flow-cytometry on rat lymphocytes (splenocytes) using Ab00576. 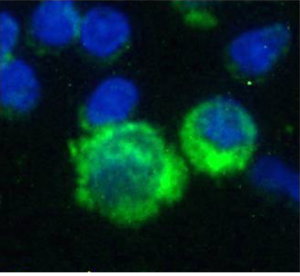 Flow-cytometry using anti-CD45RA or A/B (Receptor-type tyrosine-protein phosphatase C isoform) antibody OX-30 (Ab00576) Staining of rat (Rattus norvegicus) lymphocytes with either an isotype control (A) or the rabbit-chimeric version of OX-30 (B, Ab00576-23.0) at a concentration of 1 µg/ml for 30 mins at RT. After washing, bound antibody was detected using an Alexa Fluor ® 488 conjugated donkey anti-rabbit antibody (ab150073) and cells analysed on a FACSCanto flow-cytometer. IF staining of rat splenocytes using Ab00576. Immunofluorescence staining of fixed rat splenocytes with anti-CD45RA or A/B (Receptor-type tyrosine-protein phosphatase C) antibody OX-30 (Ab00576) Immunofluorescence analysis of paraformaldehyde fixed rat (Rattus norvegicus) splenocytes on Shi-fix™ coverslips, permeabilized with 0.15% Triton stained with the chimeric rabbit version of OX-30 (Ab00576-23.0) at 10 µg/ml for 1h followed by Alexa Fluor® 488 secondary antibody (1 µg/ml), showing membrane and cytoplasmic staining of a subset of cells. The nuclear stain is DAPI (blue). Panels show from left-right, top-bottom Ab00576-23.0, DAPI, merged channels and an isotype control. 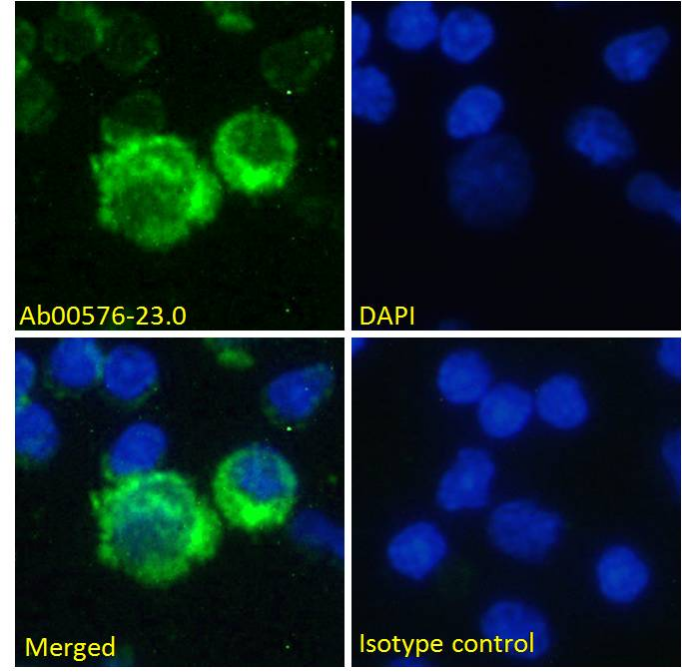 The isotype control was stained with an anti-Fluorescein antibody (Ab102-23.0) followed by Alexa Fluor® 488 secondary antibody. WB on rat thymus tissue lysate using Ab00576. 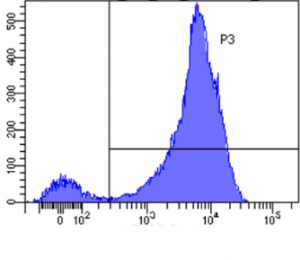 Western Blot using anti-CD45RA or A/B (Receptor-type tyrosine-protein phosphatase C) antibody OX-30 (Ab00576) Rat thymus lysate samples (35µg protein in RIPA buffer) were resolved on a 10% SDS PAGE gel and blots probed with the chimeric rabbit version of OX-30 (Ab00576-23.0) at 2 µg/ml before detection using an anti-rabbit secondary antibody. A primary incubation of 1h was used and protein was detected by chemiluminescence. 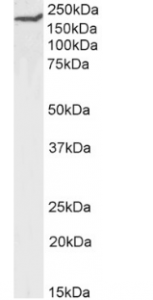 The expected band size for unmodified CD45RA is ~143.3kDa, but this protein is also highly glycosylated (UniProt Id: P04157). Ab00576-23.0 successfully detected CD45RA or A/B in rat thymus tissue lysate.